While there is so much that we could write and teach you about Tahitian Pearls – if you read our last blog you probably have a decent basic knowledge of what they are, and what makes them so unique. In this second part, we are going to elaborate a bit more on what types of shapes they come in – as well as what to look for when making a purchase. Many people assume that all saltwater pearls are round. A common thought is that if it has an unusual shape – then it is most likely a freshwater or natural pearl. This misconception could not be further from the truth. Freshwater pearls can also have a round like appearance, but typically are irregular in shape but also can look more oval. We have mentioned this before, but some jewelry stores will try to highlight how a pearl is “natural” – therefore more desirable and deserving of a higher price tag. Tuck this in the back of your mind, but if anyone ever tried to sell you a natural pearl – run. The harvesting of wild oysters is illegal and as a result 99.999% of all pearls on the market have been harvested in pearl farms. – So chances are if someone ever tries to sell you a “natural pearl” at best they are misleading you. Because saltwater pearls are not cultivated in a lab and are a naturally evolving process, they can have gorgeous unique and beautiful shapes. Obviously, many people are familiar with round pearls. Since Tahitian Pearls are a larger pearl variety, they come in incredible shapes such as teardrop, oval, drop, baroque, semi round, and button. You can imagine with the incredible colors and overtones that Tahitians are famous for how these unique shapes would only accentuate their beauty. One of the things to keep in mind when selecting a pearl shape is that it is important to select the shape that appeals most to you. Generally speaking, true round pearls that are larger in size tend to be slightly more expensive, but many people find themselves preferring the unique more irregular shapes. The choice is solely yours – and you can’t make a wrong decision. 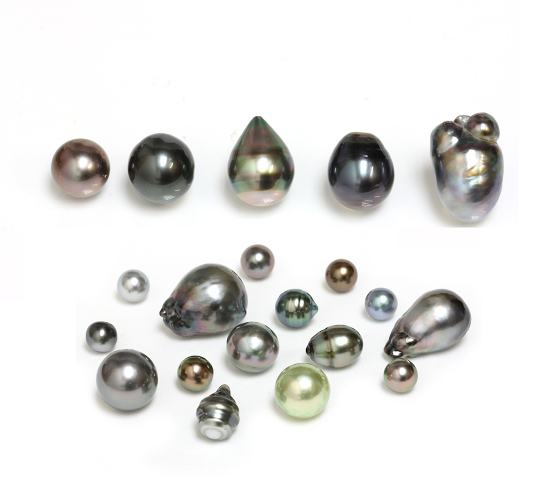 It can be very exciting to purchase your first real piece of Tahitian Pearl jewelry – but it can also be a bit overwhelming once you start to look at how pearls are graded. The good thing is that you don’t need to have full knowledge of how pearls are graded – just a basic one so that you can make an educated decision of what you are looking at. Pearls today are graded in a very similar fashion to diamonds – if you have ever heard of the 4 C’s of diamond grading then you know what we are talking about. Pearls have two types of grading systems. The most common is the AAA-A grading system – since that is the system we use, that is the one we will discuss here. The main takeaway points for what to look for when purchasing a piece of pearl jewelry is to 1.) know that pearls all have different levels of quality and 2.) it is important to balance out each category of grading so that the piece as a whole is beautiful. You might be asking what we are referring to in our second point – well, we will tell you! When it comes to pearls, there are three main aspects that need to be taken into account: The surface clarity, the luster and the nacre. Typically jewelers will categorize a pearl as whole, which can make it challenging to determine just what type of quality you are receiving. 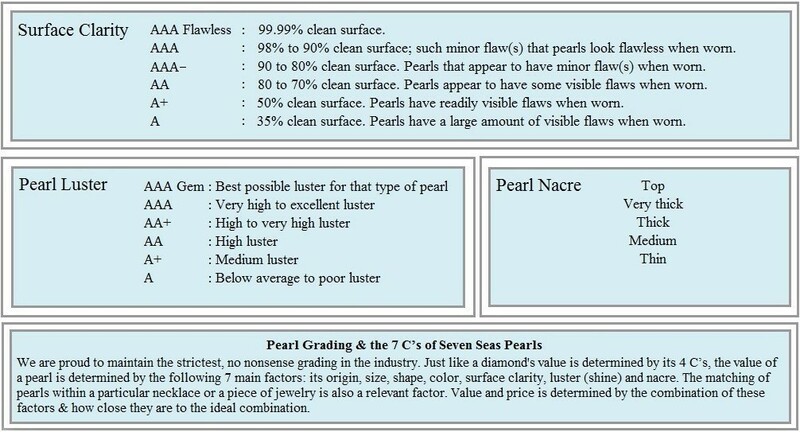 At Seven Seas Pearls, we grade each pearl on each individual characteristic. When you view pearls on our website you will see that each are graded individually on their clarity, luster and nacre. At Seven Seas Pearls, we have an additional rating category that describes the very few pearls that exceed the standard AAA-A grading system. You will see that these pearls are described as AAA Flawless for their clarity and AAA Gem for their luster. Below is a detailed chart that will give a very simple and straightforward illustration as to what the main difference is between each of the gradings. As always, if you ever have any questions at all, please do not hesitate to let us know. This entry was posted in Uncategorized by sevenseaspearls. Bookmark the permalink.